Note: He broke his maiden on the third try at Delaware Park last year, then won an allowance at Parx and was fourth in the Remsen (G2) at Aqueduct. 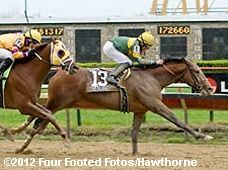 Made his 2012 debut in the Gotham where he ran a distant 10th, then he shipped to Hawthorne Racecourse where he was a surprise winner in the Illinois Derby (G3) for his final prep. Ran poorly in the Kentucky Derby, finishing 14th.